In a composition assessment, students compose a score that is graded against standard part-writing rules and the authority analysis visible in the theory line below the score. Composition assessments can include pitch and pitch-class notation, triad and seventh chord notation, and 2-voice contrapuntal and 4-part SATB part-writing exercises. In an analysis assessment, students study a score and then enter appropriate analytical symbols into the theory line. Students' symbols are then checked against the authority analysis. Analysis assessments can include pitch, pitch-class, or scale-degree identification, chord symbol identification, or diatonic and chromatic roman numeral analysis. In a mixed assessment, students compose a score and complete an analysis, both of which are then independently compared against the authority analysis. The total point value of a mixed assessment will be sum of its composition and analysis points. The Figured Bass Assessment is a specific example of a mixed assessment. In Harmonia you can convert any music score into an analysis or composition assessment. In this documentation we demonstrate both types of conversion using an example four-part score that is available for downloading from our website. Please see Importing Music XML for more information. Before converting a score into any type of assessment, first ensure that the musical pitches are correct. In particular, any visible Harmonia error annotation on the score should be resolved before converting the music into an assessment because those errors will affect the grading. Also consider resolving warnings and comments before converting to an assessment. In the case of an analysis assessment, the theory line should contain the symbols you want the students to provide by typing them into the assessment's theory line. For example, in an analysis assessment of a four part-score score you will want the theory line to display the roman numerals you expect the students to provide in the exercise. A theory line displaying roman numerals is suitable for creating either a four-part composition assessment or a roman numeral analysis assessment. 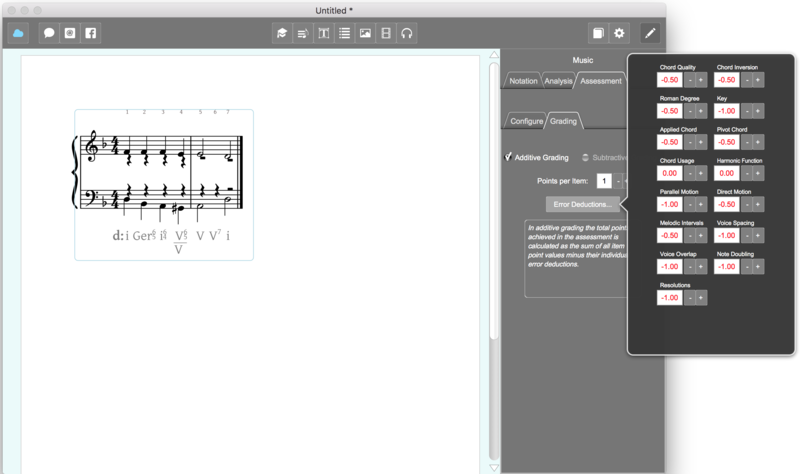 If you convert the score to a composition assessment, use the Analysis Editor to select the theory-line display style you want the students to use as their guide for composing the score. For example, in a typical four-part composition assessment, the theory line will display either roman numerals or figured bass. A theory line displaying figured bass is also useful for creating a four-part composition exercise. Once the score and theory line are ready and the score is selected on the page, click on the Assessment tab in the Music Editor to open the Assessment Panel. You will use this panel to convert the score into an assessment. The Convert panel in the Assessment Editor contains three controls: a "Save Pre-assessment File..." button, a drop-down menu that contains a list of possible assessment types to convert the score to, and a button that changes the score into the kind of assessment selected. Select the Assessment tab to convert a score into an analysis or composition assessment. The Convert to Assessment button at the bottom is inactive until an assessment type has been selected from the pull-down menu. If the document does not yet contain any assessments, you can use the Save Pre-assessment File... button to save current document contents in its pre-assessment state before your convert the score (and document) into an assessment. Saving the pre-assessment version is useful if you want to re-use the contents of the document (e.g. its scores, text, and images) at a later time to make other kinds of assessments. Clicking the Save button will open the standard Save File dialog and show the default file name with the term "[Pre]" appended to it as a way to clearly mark the saved file as a pre-assessment document. When a score is converted into a composition assessment the symbols in its theory line are locked and notes in the score can be converted into draggables, i.e. items that the student moves up and down to compose the score. The completed composition is then analyzed by Harmonia and compared against the the authority analysis to determine a grade for the assessment. When a score is converted into an analysis assessment the notes in the score are locked (made unselectable or editable) and the symbols of the authority analysis currently visible in the theory line become hidden. The theory-line entries are then converted into empty fields (boxes) for the student to enter their analysis symbols. The completed analysis is then compared against the hidden authority analysis to determine a grade for the assessment. When a score is converted into a mixed assessment notes in the score can be converted into draggables and the theory line contains empty fields. The completed composition and the analysis are analyzed by Harmonia and independently compared against the the authority analysis to determine a grade for the assessment. The total point value of a mixed assessment will be sum of composition points and analysis parts. Students compose a score that satisfies a roman numeral analysis or figured bass line visible in the theory line. This kind of assessment is available for scores that Harmonia processes using its Harmonic Analysis engine. Students type roman numerals into the theory line. This kind of assessment is available for scores that Harmonia processes using its Harmonic Analysis engine. A mixed assessment that combines Roman Composition and Roman Analysis in one assessment, always displaying figured bass symbols directly below the score and above the theory line. Students type chord symbols into the theory line. This kind of assessment is available for scores that Harmonia processes using its Chordal Analysis or Harmonic Analysis engine. Students compose chords that satisfy the chord symbols visible in the theory line. This kind of assessment is available for scores that Harmonia processes using its Chordal Analysis or Harmonic Analysis engine. Students type chord symbols in the theory line. 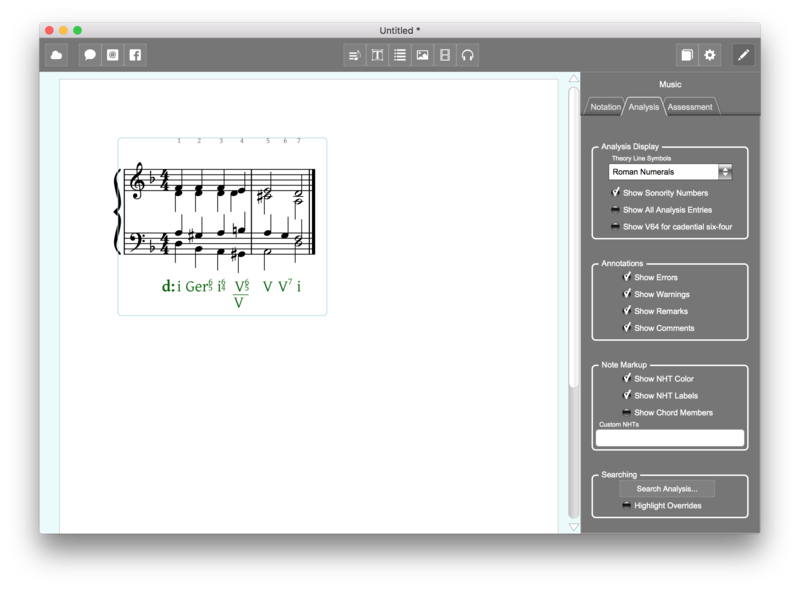 This kind of assessment is available for scores that Harmonia processes using its Chordal Analysis or Harmonic Analysis engines. Students compose chords that satisfy the chord types visible in the theory line. This kind of assessment is available for scores that Harmonia processes using its Chordal Analysis or Harmonic Analysis engine. Students type scale degrees into the theory line. This kind of assessment is available for scores that Harmonia processes using its Scale Analysis engine. Students compose pitches that satisfy the scale degrees visible in the theory line. This kind of assessment is available for scores that Harmonia processes using its Pitch Analysis engine. Students type intervals in the theory line. This kind of assessment is available for scores that Harmonia processes using its Interval Analysis engine. Students compose pitches that satisfy the intervals visible in the theory line. This kind of assessment is available for scores that Harmonia processes using its Interval Analysis engine. Students type pitches in the theory line. This kind of assessment is available for scores that Harmonia processes using its Pitch Analysis engine. Students compose pitches that satisfy the pitch names visible in the theory line. This kind of assessment is available for scores that Harmonia processes using its Pitch Analysis engine. Once you select the assessment type, click on the Convert to Assessment button to actually convert the score. The Assessment Editor will then reconfigure itself to allow you to customize the new converted assessment. As soon as a score is converted into an assessment the Assessment Editor installs controls for customizing the display and behavior of the newly converted score and theory line. The controls differ according to the type of assessment being configured. Displays the analysis symbol (answer) the student would otherwise provide, and makes that symbol inactive and ungraded in an assessment. If the entry currently shows the answer, the Clear Answer button will replace it with an empty entry, and that entry will become active and gradable in the assessment. Makes the selected entry in the theory line invisible and ungraded in the assessment. Note that a hidden entry will appear as a entry with a dotted border for teachers, but when a student views the assessment, a blank space will appear in that position. If the selected entry is currently hidden, the Unhide Entry will make it visible and active in the assessment. Normally the first entry in a Roman Numeral analysis includes the "home key" of the analysis. If the Friendly Key toggle is off then the student must provide both the key and the roman numeral in the first entry of the piece. Toggling the Friendly Key button will display the home key for the student and only the roman numeral will need to be typed for that entry. If you do not choose to use the Friendly Key button, remind students in the assessment's written instructions to include the key along with the first chord label in the first entry. The Friendly Key toggle is only active for the first text-box entry of the piece or in entries containing a direct modulation. The Assessment Randomization controls are not active for analysis assessments. Customizing the theory line of an analysis assessment. The answer for the secondary dominant was made visible and inactive using the Show Answer button, and the first entry uses the Friendly Key feature so the student only needs to provide the roman numeral. Converts the selected note into a draggable or an inactive note, depending on the current state. Converts all the notes in the chord containing the selected note into draggables or inactive notes, depending on the current state of the selected note. Converts all the notes belonging to the same voice as the selected note to draggables or inactive notes, depending on the current state of the selected note. Converts all the notes in the score to draggables or inactive notes. Locks or unlocks the selected note, depending on the current state. Locks all the notes belonging to the same voice as the selected note. Unlocks all the notes belonging to the same voice as the selected note. Mixed assessments display the composition controls and the analysis controls together in the configuration editor. Sets the range of possible transposions in semitones above or below the original score. For example if the control is set to 3 then the score can be transposed anywhere within a minor third above or below the existing transpostion. Note that this feature will not check to ensure that all voices stay within their traditional instrumental ranges so choose this bandwidth carefully. Determines the maximum number of accidentals allowed for the transposed keys. As you select this number, the list of possible keys will appear in the panel directly below the control. Customizing a composition assessment. Alto and tenor voices are converted to draggables and soprano and bass lines are locked so students cannot alter them. Random transposition is enabled for five possible keys within a minor third of the existing score. Before saving and adding an assessment to your Harmonia course, check the grading scheme to make sure it corresponds to your grading needs. Harmonia currently offers Additive Grading, in which the total points achieved in the assessment is calculated as the sum of all item point values minus their individual error deductions. Look to future releases for Subtractive Grading to be offered as an additional grading choice. To make any changes to points values, click on the Error Deductions... box. Depending on the assessment type, specific possible errors will be available for editing in a pop-up window. Use the pre-set deductions or make your own changes. The Grading Editor allows you to determine the points and error deductions that Harmonia will use for grading the assessment. Setting a deduction to 0 eliminates that check from the grading scheme. Once you configure all the assessments in the document, and add any headers and instructions you want the students to see, save the file and quit Harmonia. Log into your course on our server and upload the file for delivery to your students. For more information on this process see Add homework assignments to your Harmonia course.